Great hostel and absolutely the best pizza in the world! Friendly stuff working with passion and all effort to make you have a good time. Definitely worth to go there! Not one to normally leave a review but this hostel was absolutely epic. The guys that work that literally couldn’t have been more friendly from start to finish and there was a really nice, muy tranquilo atmosphere in the whole hostel. It's a really lovely hostel which has been always kept clean. The staff is always present when you need something and all of them are very friendly. The place it's located at is very close to the beach and you can see the sea while sitting outside the hostel - which was lovely for me, since most nights had a full moon in the sky. I really loved this place and I will definitely choose it again when I come back to Punta del Diablo. The stuff is amazing, funny and nice guys that makes everyone feel comfortable and welcome. The rooms are clean and so are the bathrooms and showers (the best we ever saw). 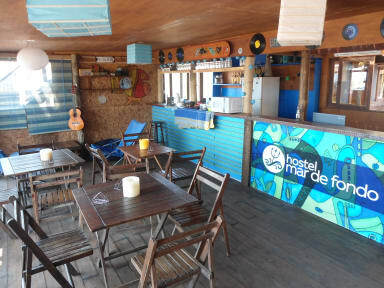 We had a great experience from this hostel which made us want to come back to Punta del Diablo. This hostel is one of those places, where once you get in, you don’t feel like ever leaving. 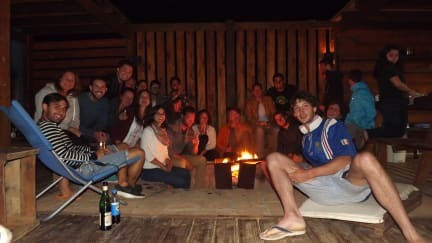 The staff is simply amazing, keeping the atmosphere of this hotel very social, specially with the asado nights. It’s close to the beach, there’s a supermarket nearby and if you continue to Brazil, they’re ready to help you with the buses etc. Thank you guys for everything! Good hostel in an excellent location. The meals at night are economcal and tasty, which is definitely welcome as Uruguay is expensive. It´s also good for socialising as most guests will go for this option. The hostel also has beach umbrellas that guests can use, which was such a nice bonus. Rooms are small and tight when 4 people are in there but overall it was ok for the 3 nights I was there. The staff are great and every night they cook food for a cheap meal and you get to meet lots of new people. Great location and great staff. The community dinners each night make this a great spot for solo travelers or small groups looking to meet other travelers. Great hostel. This is a super chilled out place, the staff are great, location is good. It could do with some ceiling fans, the rooms were a little cramped and the kitchen is basic.